The Hennepin Crawler, in 2008. Ty Jones walks around Railroad Square, relieved and excited. Relieved because just last week, he and Handcar Regatta co-founder Spring Maxfield—with lawyers, both—officially dissolved the Handcar Regatta name. "It was like a divorce," Jones explains. "We had different ideas about the way things should work, and they way companies should work. I've got nothing bad to say about her." Excited because this morning, he's announced Dr. Erasmus P. Kitty’s Kinetic Frenetic Opera of Mechanical Mayhem, a Regatta-esque festival planned for Summer 2012 "featuring music, film, performance, and kinetic railcar mayhem." No exact location is set for the event, but that doesn't get in the way of Jones' many ideas for the new event, which he plans as a multi-day arts festival that perhaps "won't look like the Regatta." "It'll still be a rail race," he says, adding that he's been talking to some of the old Regatta crew, gearing up for another run. "But one of the ideas with the Regatta is that it would expand to incorporate these ancillary events"—he mentions the Wiskeydrunk Cycles gang, the Feed Barn in Rincon Valley. "So how can it spin off into the community, and foster the arts?" Jones cites the Sonoma Arts Council's recent move to Rohnert Park as a symbol of the splintered nature of the arts community in Santa Rosa, and recognizes that the Regatta represented a coming together of disparate organizations. Just this week, Jones has been in talks with Chops Teen Center and the Sixth Street Playhouse, but he's not counting on being able to return to the Santa Rosa railroad tracks, where SMART has development planned. Last September, SMART informed Jones and Maxfield that the site wouldn't be available in 2012 due to construction for the long-awaited SMART train. 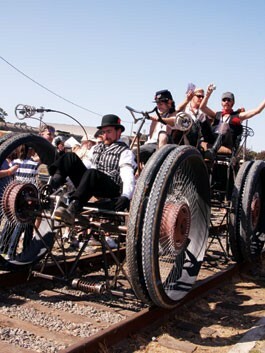 The Frenetic Kinetic Opera could be held along the tracks in Windsor or Healdsburg—anywhere north of Coddingtown, really—but if construction hasn't yet begun in Santa Rosa by summertime, Jones is hoping that SMART will see the value of hosting the festival again in Depot Park. I can think of 15,000 others who've attended and loved the Handcar Regatta in Santa Rosa, and who'll be hoping the same thing. Wherever it's held, Jones says, "it's just too much fun to let it go." For more, cue up the Frenetic Kinetic Opera whirly-gig virtual bulletin of web-site bill-posting.